You're currently viewing posts by Pinsider sgorsuch. My Pro game arrived on Friday, and i was having the exact same issue as Arcade in post #168. Drop target would trap a ball and no amount of ball searches would free it.The game would kick anther ball into the shooter lane after about 4 ball searches and the ball count really confused the game. 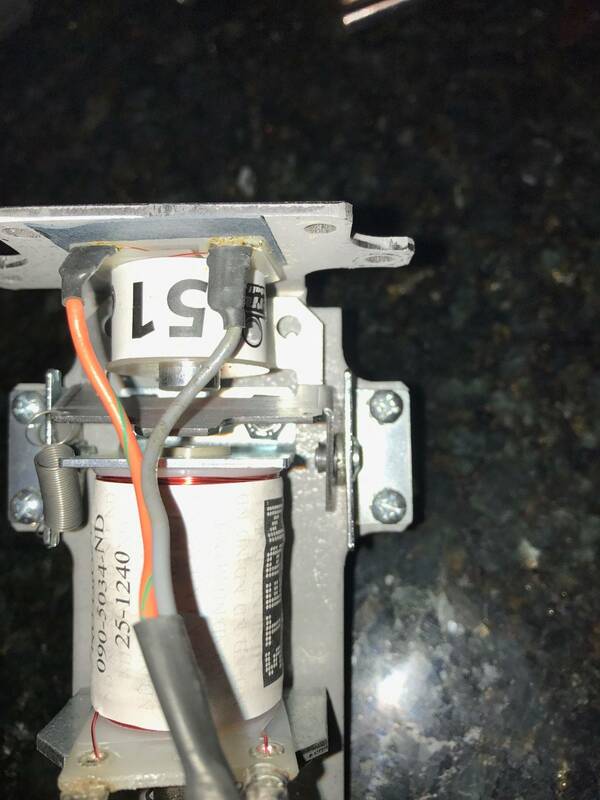 I opened the coin door to see it the release coil was firing and it was, so i was thinking this has to be a mechanical issue. I removed the target assembly from the game and manually pushed the drop target trip bracket. I found that if the bracket was shifted to the right away from the spring side- the target would not trip. I removed the right pivot bracket and placed a small washer on the pivot shaft. This cured my issue completely. This is the first pin I've every purchased brand new and it was pretty hard to pull the trigger. 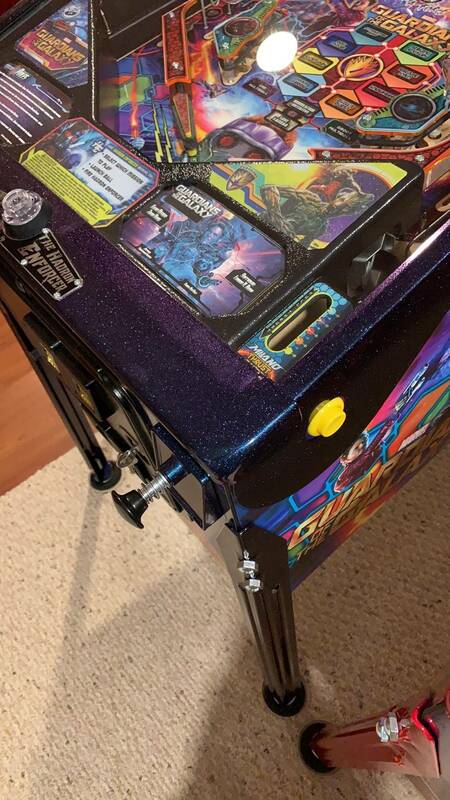 I'm a relative noob when it comes to pinball and I've only owned one other machine (TSPP). I have kids and a wife and the new Marvel movies are one of the few things all of us enjoy together so this seemed like the perfect time to jump in head first. I saw the photos and knew it would have enough on the play field to keep everyone interested. We played a little bit of the launch code and then quickly updated to .72 where I really noticed the call-outs and how much they add to the experience. The kids and wife enjoy playing it but seem to struggle a bit with really quick drains. They're used to that having played TSPP so it wasn't a big deal. Especially because of the amount of audio/video coming out of the machine at all times. I'm about as happy as I could have imagined I'd be and I'm glad I bought it. Reading through the other thread had me a little worried but I had to remind myself that I'm a novice player and am trying to buy a game that appeals to my family. 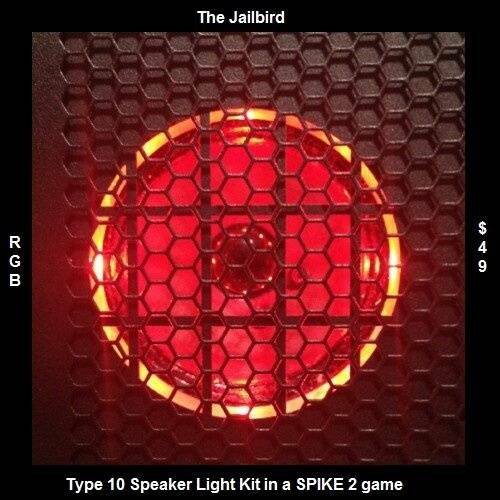 The pin is fast, loud, bright, and fun. 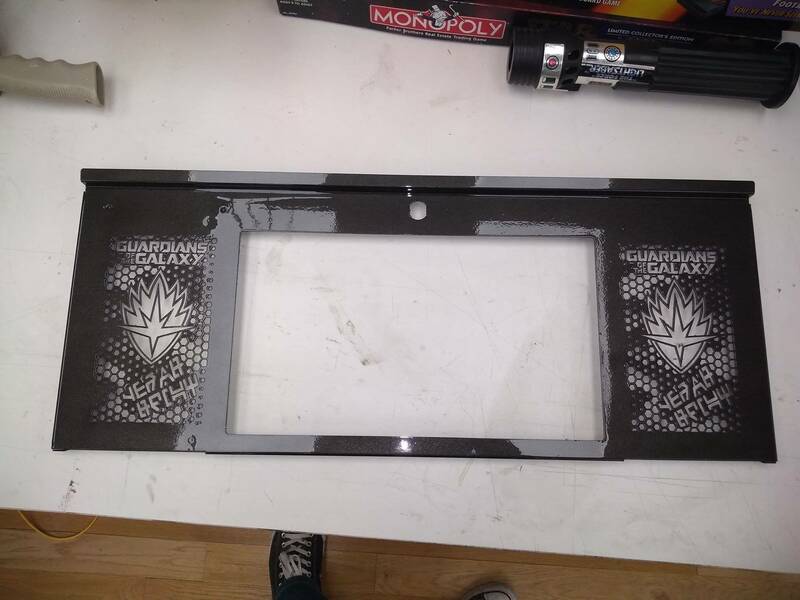 The next step is to figure out what protective mods need to be installed and where to find them. Congrats MrClutch! I am very happy with my pro-buying it sight unseen without even playing was a bit of a speculation,but I am pleased with it. 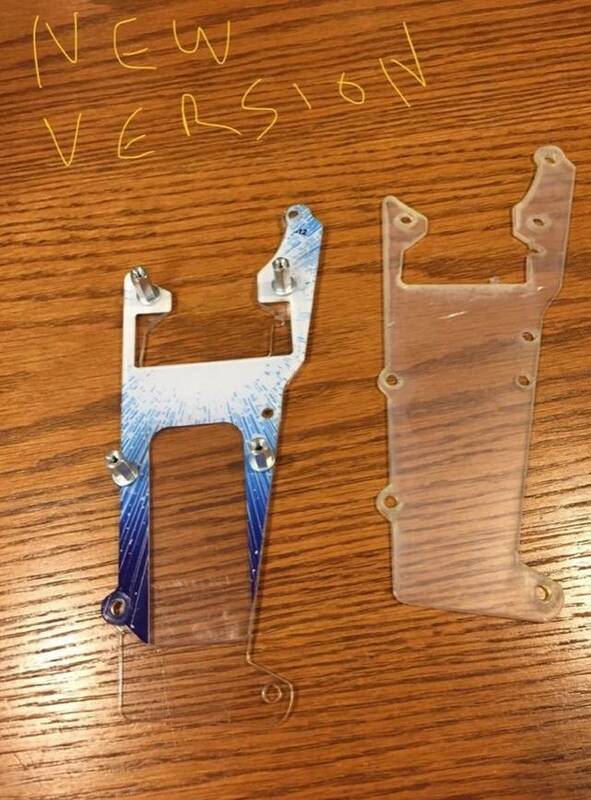 ULEKstore has some plastic protectors that I think are great quality and design for the slings,return lanes, right orbit,Rocket and pops. This game is very challenging,I had a 45 minute game and only completed 3 modes.It will take some time to get to the wizard modes. I have had a TSPP for a couple years now and the very best I have done is complete 3 of the puzzle pieces to get to the wizard mode- i know this will never be achieved by me, but it is still fun to try. Perhaps I should clarify- this was a 3 player game. I don't normal time the games - just remember what time one of the players had to leave.Perhaps it is also a testament as to how poorly i play-ha. I finally read the rules and found out that the HE button does more that pick the mode, but also helps complete shots if all the HE targets are hit. Has anyone seen a vague rule set for this game yet? 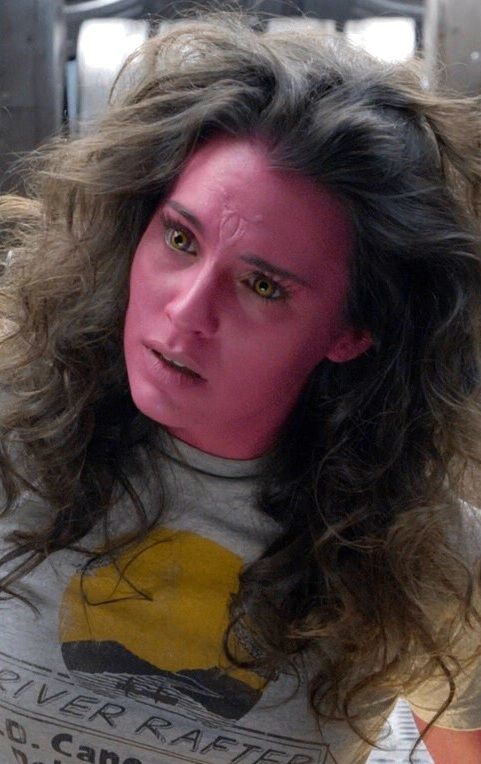 I was wondering what it takes to get to Immolation Initiative and Save Xandar. My assumption is that 4 connected modes need to be completed to get to Immolation, and that all modes need to be completed to get to Save Xandar. The best I have done in a 5 ball game is to complete 5 modes, but they were not connected as illustrated on the play field. Looking at the rule set closer on the game- it appears that all modes at least started and both multiballs will qualify for a shot at the right scoop for Immolation, and that all 8 modes completed will qualify for the same shot at the scoop. I was thinking that it might have been similar to GB ,where a completed ladder would advance you to another mode. Just had a great game on .80 code-469 mil, but it was tainted as during Sibling II(I think) mode the ball went into the right scoop and would not come out. 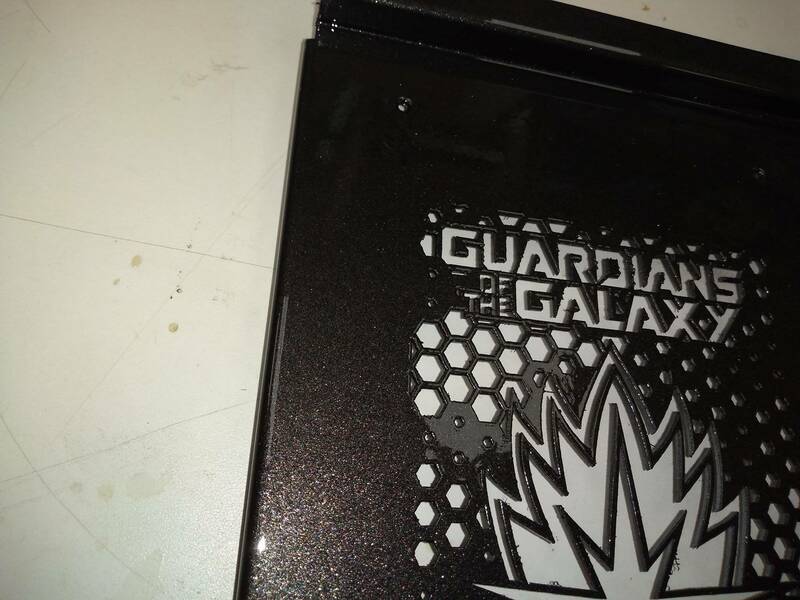 The game went into several ball searches, emptied the balls in the Groot trough, but alas, the eject coil never fired . I removed the ball from the scoop and dropped it into the shooter lane ,quickly put the glass in place and continued play- but some of the joy was gone due to the interruption . Pretty sure this was a bug-as during other Mode II scenes as soon the ball went into the scoop-Mode II play stopped and option to pick next mode occurred. I did complete all the modes and was in an Orb MB- the scoop was alternating flash between purple and white-but I do not know where I was in the game. Forgot to look at the 2 wizard mode inserts as I looked up to see the scene with Quill and Bereet on the Milano. Code.81 really helped my game out. 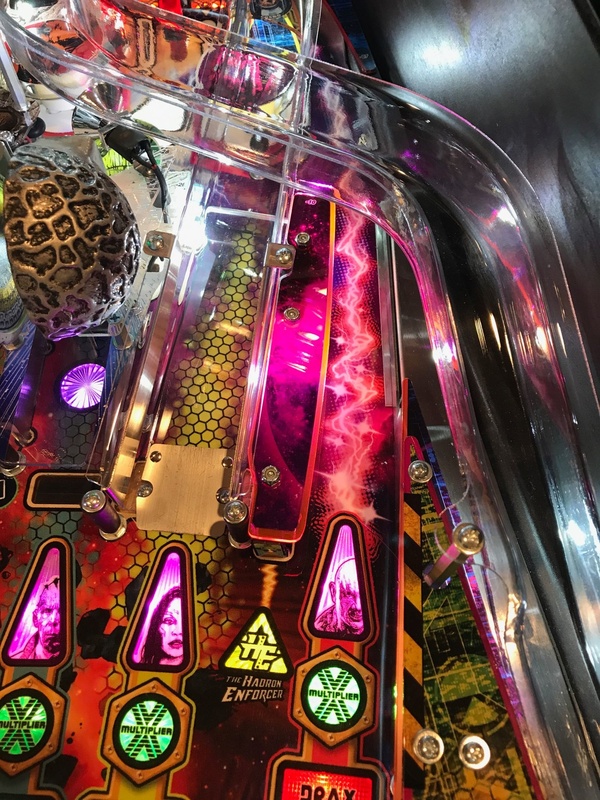 On the .80 code I was having issues with the ball stuck in the right scoop-usually when the bonus multiplier screen was up and the ball went into the scoop. No amount of ball searches would eject it from the scoop. This happened occasionally with the Groot Lock,but after a few searches it would either kick a ball into the shooter lane or kick the ball out of Groot. I think I must have 20+ games on .81 and no issues.This game is a lot of fun,really enjoying it. Yikes!! Just had a reset during a game. Hoping it was a fluke and nothing like the last few posts about bad CPUs. I am a little concerned about some of the phase II modes. I think I just finished Sanctuary and I drained the ball, then as the ball entered the shooter lane- the screen had Kyln II...that one set me to pondering.I am still scratching my head about the mode II for Sibling- think it is a non winnable mode for 100 hits on an spinner that I have yet to see on my Pro. The 2 new songs are a welcome addition to the game- just 2 songs was wearing thin.Still crossing my finger in hopes that "Come and Get your Love" is added. I have completed all the modes during a 5 ball game,but as yet there does not appear to be a wizard mode. I usually stack the Hadron button to complete Groot and Orb, but so far I have not completed both in the same game.I've been playing this game almost exclusively and really enjoying it. Glad to see from some of the latest posts that there are owners enjoying this game. I am hooked! Had a really good game tonight-did not complete the ORB MB but got further and had videos with Bereet and finally the Collector. 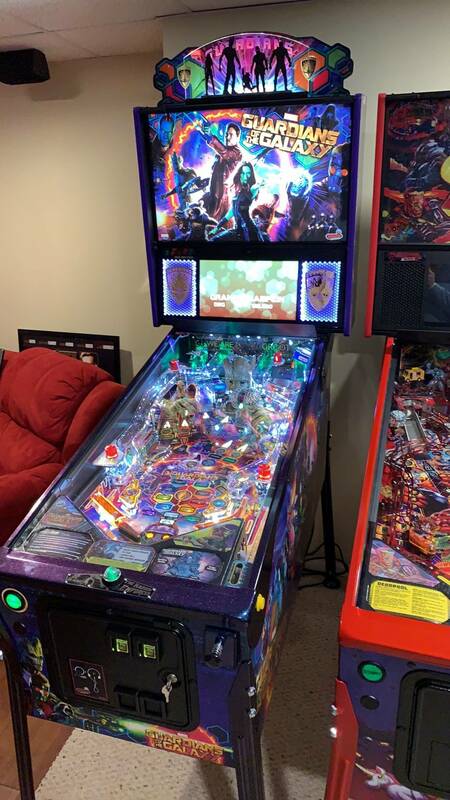 During both MBs there are times when the playfield is completely dark- considering putting in a SMD in the outhole area to help with this. Has anyone seen the Special lit yet? It flashes briefly in ORB MB , but never sustained. Hello All. 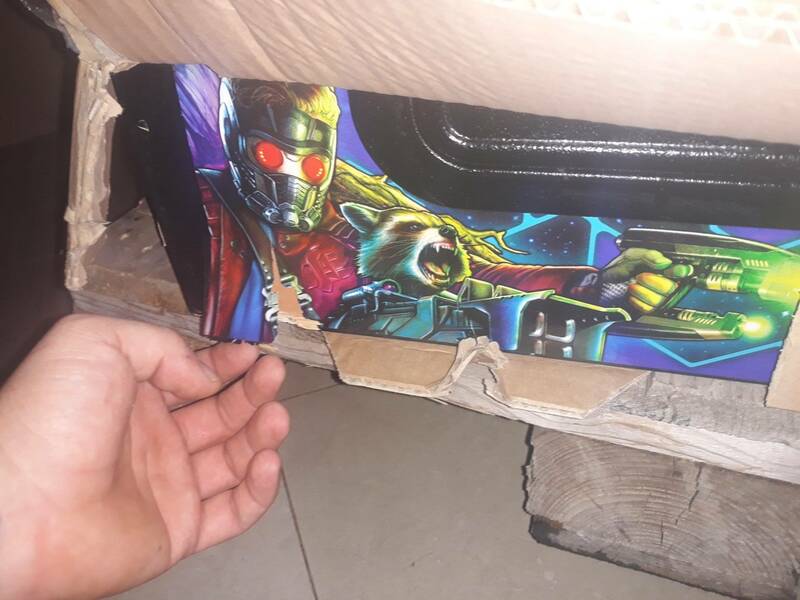 New member and new owner of GOTG LE #98. Great game however the Orb drop target is consistently trapping the ball and not releasing it. 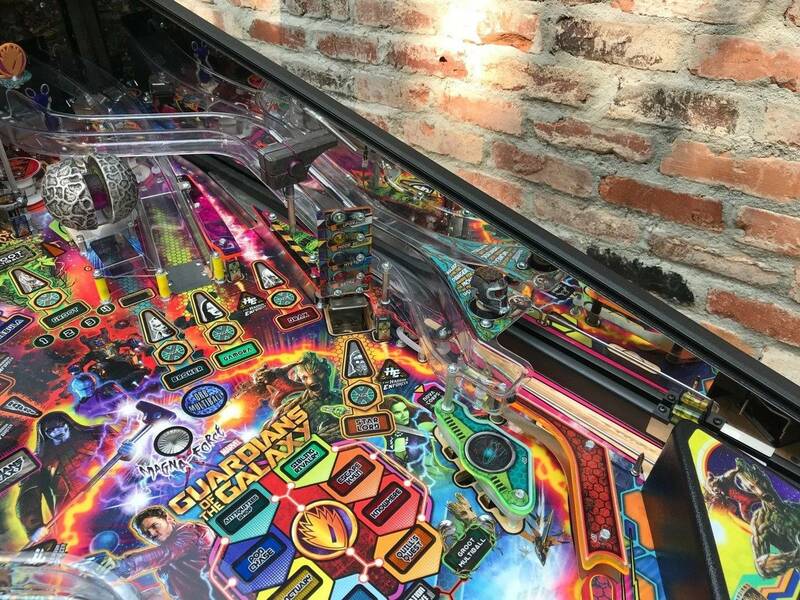 This is causing the game to search / cycle for the ball and finally give up with a Pinball missing error. This happens every time the ball get behind the drop target. I first thought it was code related but now I'm not so certain. Is anyone else experiencing this with .81 version of the code? It almost seems like this is happening more often with this code rev but it could be that it is a mechanical issue that is getting worse. Thanks. 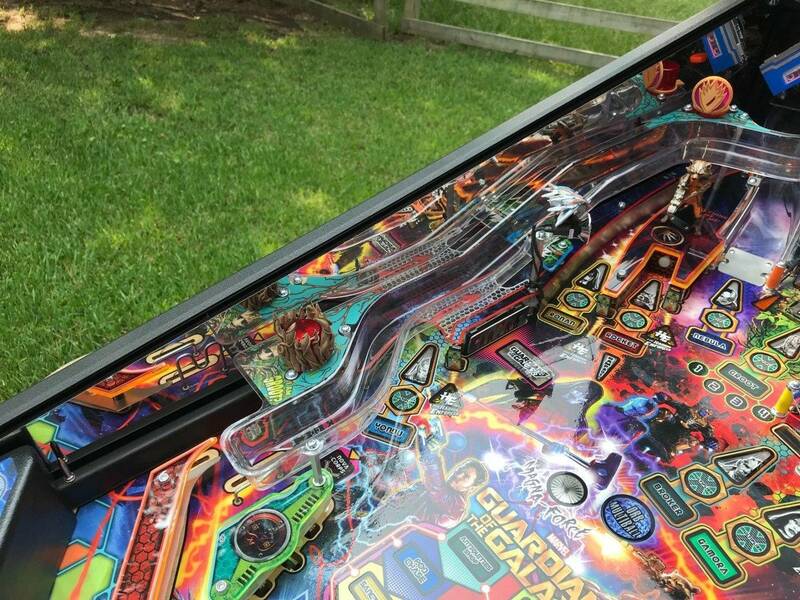 GotG Pro is my first pin and I've got a ton of games on it already, but would like to know if there is any sort of detailed rule sheet for it. Specifically I'm curious about how the Sanctuary mode works as I seem to complete that mode without making any shots until after the timer has expired. As for my enjoyment of the game, I think it's been fantastic so far. I did try a few games on the original code before upgrading it and can see why some people were frustrated with it, but on the latest code it has been a lot of fun. If there is a detailed rule set out there, I have not seen it ,nor have I been directed to it. I have wondered about the Sanctuary mode myself. It always starts out with just one shot-Drax. Then once this is made it moves to Rocket. It would seem odd that the timer for this mode runs out and automatically awards Sanctuary II- but it appears to do this more often then not. I have seen the required shot moved with each hit of the pops.I think there are only 2 required shots in this mode and then goes to the next phase of the mode. If I remember correctly-the 2 shots are made ,and the timer runs out then all shots are available in the yellow color insert. I don't usually use the Hadron Enforcer button for one of these shots - I try to stack them up for use in the MB modes-especially Orb. It is the toughest to complete.I have worked my way to the scene where the Collector is relating the story of "Beings of Extraordinary Strength" using the Infinity Stones. Has anyone seen the SPECIAL insert light yet? I am still uncertain if the Upgrade scoop is worth the shot- as in the Pod Chase- it seems you are penalized for the upgrade by only having the ramps as the required shots.I avoid the scoop like the plague in this mode. Congrats on your game OchoFosho- I really am enjoying the game. I had an X-files and it had some pretty tight shots and was hated by some, but it was a great feeling to make the shot cleanly. Today I had an Orb MB where 2 balls were held behind the drop target- what a combo. In a different game today - had a ball stuck in Groot's mouth. Did a ball search and finally went all the way down his food tube. Had great fun tonight on this game. Had six modes completed and both MBs completed. Actually sacrificed going further in the modes, was trying to get to some new scenes in ORB MB. Tough to look up at times in the fury of the MB, but did see the Collector's place in ruins after Carina reaches for the stone. The most round green X inserts that I have attained is 6. Anyone know if there is special reward for getting them all lit? I installed the latest code last night, and was pleased with the additions. I was curious about to see what the effect of having the magnet ( i have a Pro) pulse, so I removed the glass and initiated several Orb MBs. With the glass off you can hear the pulsing of the coil, but I have not noticed it with the glass on. I may have been in the Orb mode for 3 minutes when the pulsing stopped and I had no magnet. I went into Test mode and still nothing.The playfield and coil were very warm. I am not familiar at all with the Spike system, so I am now looking for fuses-ha and could not find any. I let the coil cool down and it was functioning again. I relayed this to Chas and he let me know that there is a thermal cutout on the coil.This was very comforting. Continuing to work with Chas on the intermittent weak left flipper issue. He has provided some good knowledge, but alas still in the same spot. Wondering if someone can pull out a DMM and check flipper coil resistance for me. Mine both come in at 5.5, but would be nice to have confirmation from others. Whysnow - I have 5.6 ohms on both. I saw a post that described the feel of the flippers as "spongy"- this is a great description of the feel-at times. There is plenty of power on mine,able to hit both ramps forehand and backhand. I notice the feeling usually when Rocket kicker blasts the ball at warp speed to the right flipper. I almost always still have the flipper in the up position-the ball hits the right flipper and it just feels like the flipper is absorbing the blow and the shot - if you can even call it a shot is me still holding the right flipper and the ball comes off at a slower speed than if the flipper were at rest and just bouncing off the flipper. I can't say that I have really experienced anything like this on the left flipper. Interesting about the gates...I never use the plunger , and use the action button to launch the ball- I have never had the control gates up ever. I went through the adjustment menu and did not readily see if the is an adjustment on the power of the launch solenoid. I did see one could disable the control gates. Mine definitely work as certain modes they are up and some down. I probably should stop there and not ask another question not related to to the gates, but I have typed this much... so I'll push on. Has anyone experienced The Escape Kyln II mode randomly just come up. It has happened to me several times. Was working on Antiquities, and did not achieve the 1/2 way point and drained -with time still on the mode.As soon as there was a ball in the shooter lane-I am now in Escape Kyln II. Weird. One other oddity : I am still puzzled by the easiest mode Sanctuary. Seems like sometimes 1 shot is all that is required to complete Sanctuary I- or possibly complete 1 shot, let the timer run out and every shot is lit yellow- complete any one of these to complete Mode I. Am I alone on any of this? I had the exact same experience today- I think I made 3 of the required shots and then it timed out and all the yellow inserts were there- i hit one of them and the mode is lit solid, but did not get the display for Immolation. I did however qualify for Immolation with with all the other modes and then the Immolation inset was flashing as well as the scoop. I was on my last ball and made 5 back hand attempts to put the ball in the scoop... but alas, it was not to be. I will search for the code thread and put in my 2 cents for constructive remarks for the game's improvement. I love the game , and generally will contact Chas behind the scenes, as I am not fond of reading all the airing of the grievances. Changed all the rings on the game to Titan rings,and very happy with the rings, not as thrilled with the post sleeves. In less than a week there are visible wear on them. Not sure if it was from wear or design, but the existing post sleeves were almost conical in shape. 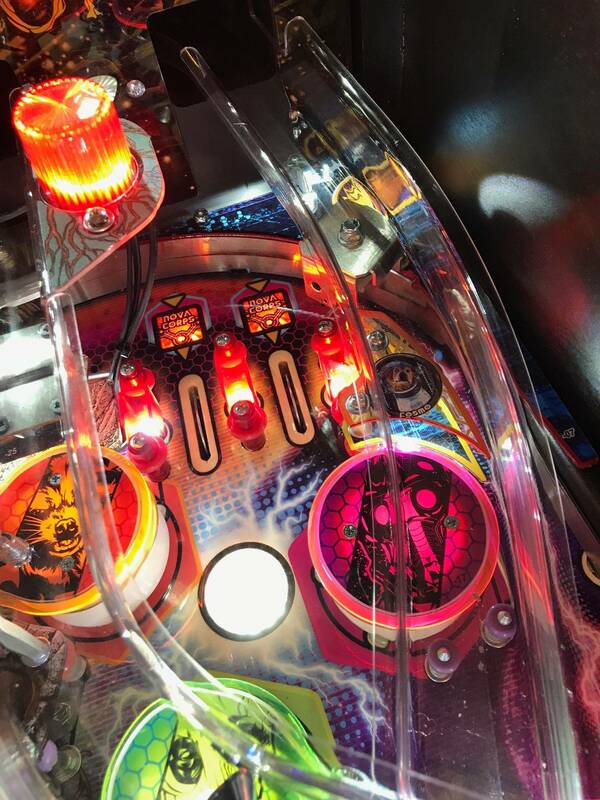 On a positive note the new sleeves seem to have an effect as the ball leaves the Orb trapped behind the target, almost every time now the magnet catches the ball in a nice swirl.Prior to changing the sleeves, about 1/2 the time the magnet would just push the ball directly to the left outlane. figured there were others out there. bought some FF speakers a couple days ago, should be in next week hopefully. I'll let you know if this resolves the issue. I was going to email chas a video of mine vs. another if this doesn't work. otherwise it's just replacing parts at random, wanted to start getting a backup node board collection going anyway. The spike 2 cpu board is freakin expensive though. let me know if you figure it out as well. I noticed some crackling sounds in certain modes, and the more blatant issue for me was after earning an extra ball and draining , the sound would cut out completely for a few seconds and return as the ball shot from the shooter lane.I was sent an new CPU- but there was no difference , so I returned the new one.I really don't know if it is hardware or software issue to be honest.Hoping an update will solve this. I just noticed today that it is impossible to get to Quill's Quest 2.I was pretty sure I earned it several times,and upon completing the last required shot in phase 1-gives you your total and then right into one of the 4 songs.Took the glass off and repeated just to be sure. Anyone else seen this before? I had not seen this before- the date was from 11/5 when the game just came out. I think I asked if there was a ruleset published and must have missed this. Seems like there should be some amendments with the number of updates since November. Installed the new code 0.87 and played a few games. 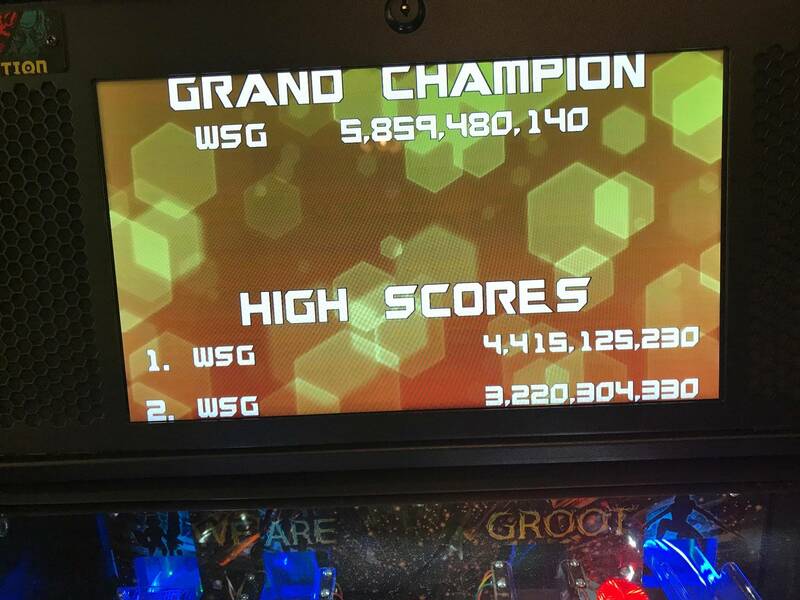 - Groot Multiball does not seem to score as much, so, good. 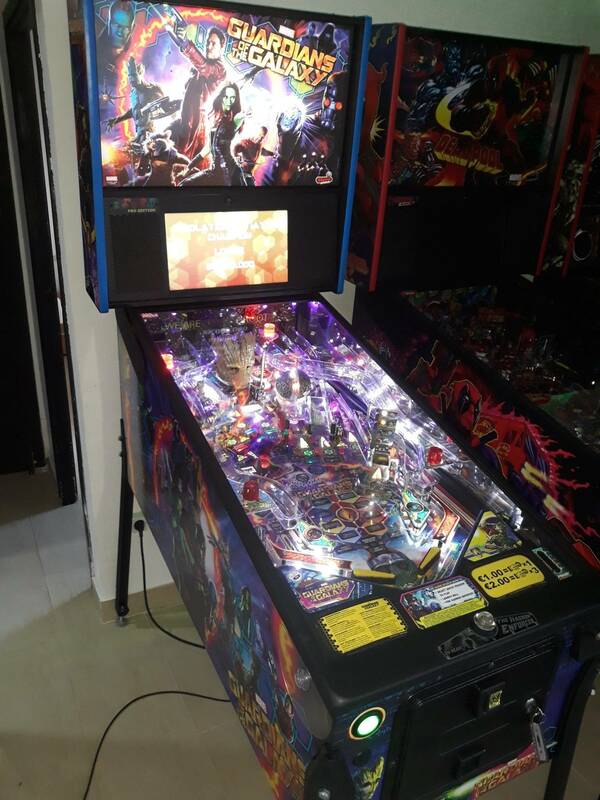 - Orb Multiball seemed much more lucrative, so better balance. - when in between modes, the generic blue hexagon screen is gone. Now a mostly static shot of the Knowhere head. - A bit more custom speech. Rocket calls out the multiplied shots by name now. - While the last code added the progress screen towards Immolation Initiative with the Dark Aster, we now have a second progress screen towards Save Xandar. Graphics are a planet with orbits, and a colored hexagon animation lights up for each completed mission. - Rocket kicker seems a little lower powered now. Still surprising, but not as deadly. - New different orchestral music when in double scoring now. Hey nice write up EV- think you hit most of the highlights. Kind of cool graphic now on each lit shot when in Broker Mode.I personally like the Orb MB better than Groot MB- had a very lucrative Orb MG tonight for an Orb total of 235,000,000 and change . I am curious if anyone has seen Quills Quest II mode? The last 2 updates- it is non-existant on my game.I completed it twice tonight and graphics for both Immolation Initiative and Save Xandar- but no phase II mode. 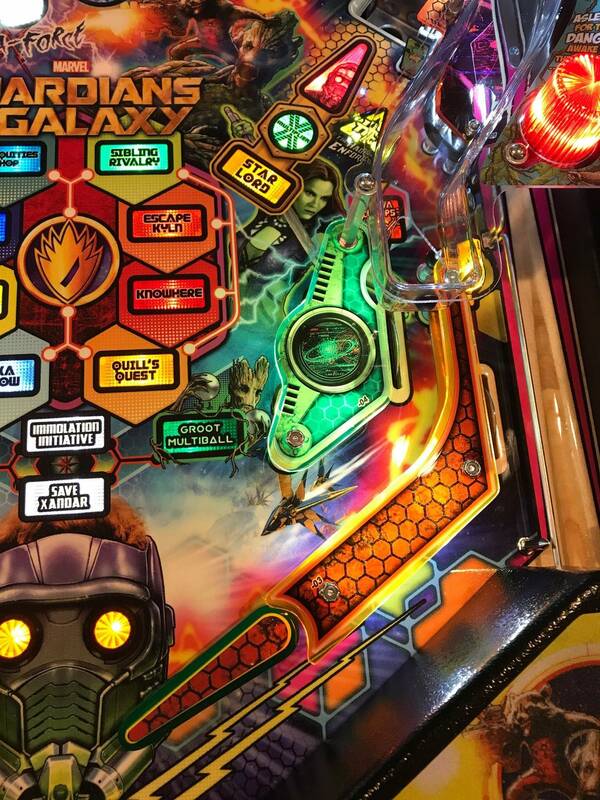 I like the Groot jaw motor integrated in (it seems) -every other super jackpot. Yup this just happened.. 1st time for this one.. All good the beer is cold!! Has anybody else noticed that you can't seem to time out on Sanctuary, it seems to just roll over into Sanctuary 2 even if you haven't completed a shot, gotta be a bug! Glad I am not the only one. I have been scratching my head on this for a couple of code updates. Looks like since the spinner nonsense has been taken out of the pro version , that there is no phase II for Sibling Mode. Apparently there is no phase II for Quill's Quest either. post update our flippers are intermittently worse/weaker so shots are constantly different/not where you expect them. Seems to be worse during big light show events. I agree Whysnow- have notice a different feel to the flipper strength, especially the left bat. Before this update- could easily backhand both left orbit and left ramp, not so now. I guess I'll clarify. Balls are getting stuck in my orb lock all the time. The drop target doesn't want to go down until ball find and sometimes not at all. cocomonkeh- I had this issue when I first got my game-see post #278. A simple washer installed cured my issue completely. The right flipper has intermittently seemed weak, and usually when trying to bat at the ball screaming out of the Rocket Launcher. I have only noticed the left acting similar after the last code update. How is the feed coming down from the right orbit for you guys? Mine usually hits the top of the slingshot and it either bounces to the left flipper, or, it tries to go down the middle. I loose a lot of balls just from this. Does yours safely feed the right flipper every time? Mine is a fight to save the ball each time. Btw, I haven't noticed any flipper strength issues before or after the last code patch. Mine seems good on that. I have been experimenting with changing rubbers on my game. I put Titans on everything about a month ago,and have been happy with everything except the post sleeves. They had worn through in less than a week.However I love the action that these sleeves give to the post in the Orb area- almost every time the ball is caught by the magnet with a nice swirl. With the original post sleeve-about 3 out of 4 releases from the Orb would be deflected by the magnet to the left outlane. The original rubbers and Titan rubbers on the slingshot made the ball from the right orbit stay true so that I could catch the ball with the right flipper or let it bounce to the left. The slingshot rubbers have worn through and I just replaced with white rubbers, they seem just a little larger in diameter- this does have an effect on the path of the ball now as it travels down the right orbit- it hits the right slingshot about 3/4 of the way up the slingshot and either drains or bounces to the left flipper.I think I will put the original black rubbers back on the slingshots. Confirmed that 4 modes must be completed to qualify for Cherry bomb MB at the scoop- it will flash red. The trough empties for the 60 seconds. 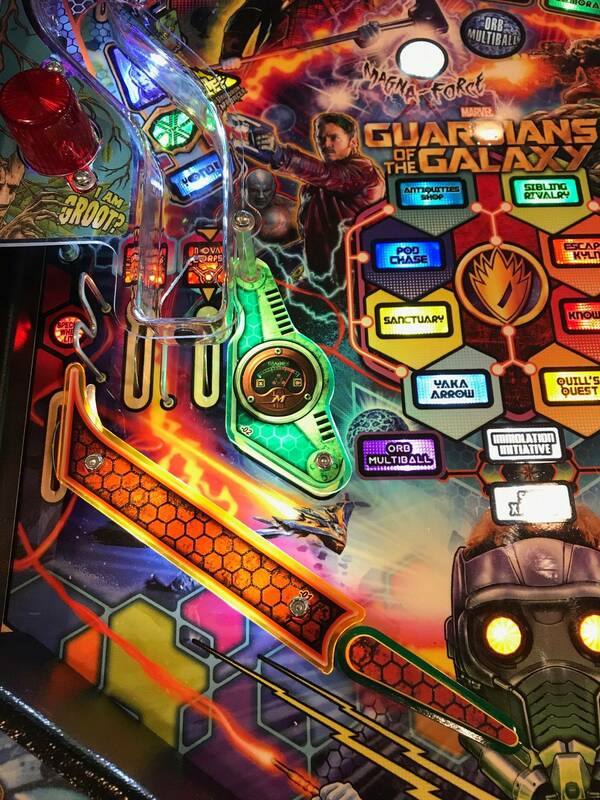 Definitely want to save up some Hadron Enforcer button shots for this-to get to the super jackpot by sinking a ball in Groot. Had a 400 million plus CBMB this morning. Still a couple things to work out on this, as if there are any balls in the scoop at the time the timer runs out- the game does not know where the ball is and will only eject on a ball search. This has happened 3 times so far. 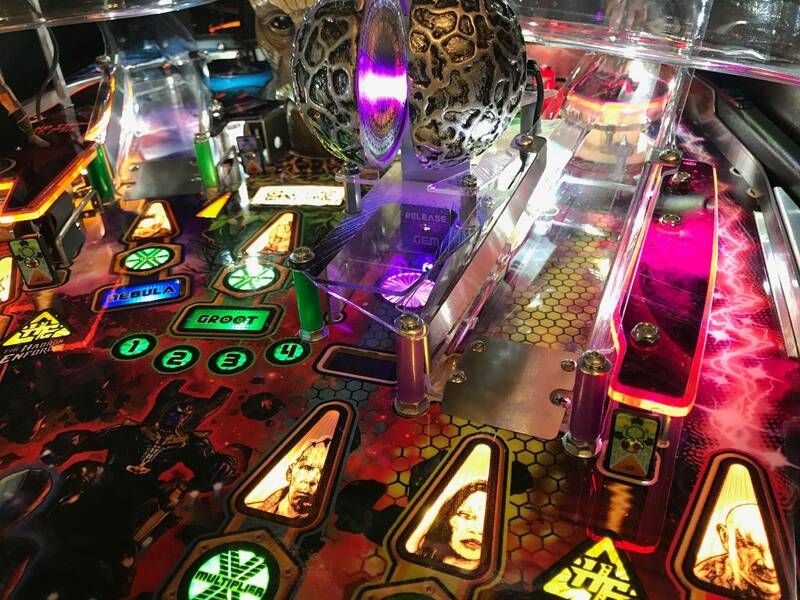 Still an fun MB , and looking forward to watching someone else play it, as there is too much going on with all 6 balls on the playfield to enjoy the animations on the display. 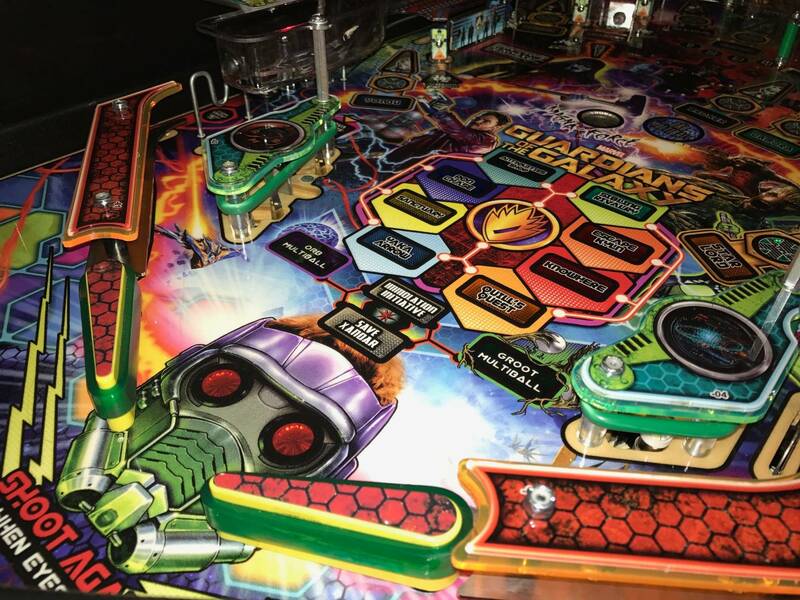 Just had another CBMB, and game acts the same if there is a ball in Groot. At least a 7-10 second delay after time runs out before a ball search to eject ball.Not a huge issue- just something that needs polishing. Got a nice award from the Mystery scoop today-Light Special.This was a first. I thought that I had read all the revisions in the update, but must have missed it. I have always wondered what shots were required to light the Special,and had chased in vain to light all the multipliers. Does anyone what shots are needed to light the special? ater updating the code on my le i've a problem with the upper magnet. after a few ball grabs from locking the ball into the orb the magnet gets very hot and doesn't grab it anymore. when i go to the service menu it doesn't work too. after cooling down the magnet works again for a little time. so the questions is do i have a bad magnet or is there a bug in the new code? Yes- I noticed the same thing, before the update, the ball would swirl and stop 90% of the time. Now it seems to just deflect the ball. 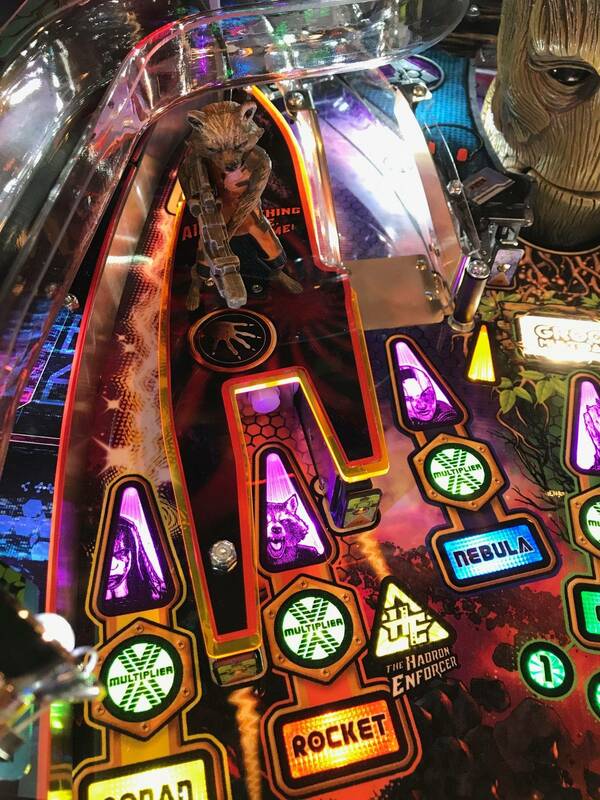 Has anyone had Groot's mouth only open halfway during Groot MB thus never allowing you to lock a ball during that mode? I see this happen about 20% of the time I get that multiball started. Otherwise the mouth behaves normally. A few times for me. The lower jaw was just a little higher than the playfield,and no shot would make it past this.Maybe like 4-5 times since November. Confirmed again this morning, the magnet isn't activating when it drops out of the Orb. No hard grab, no soft push. 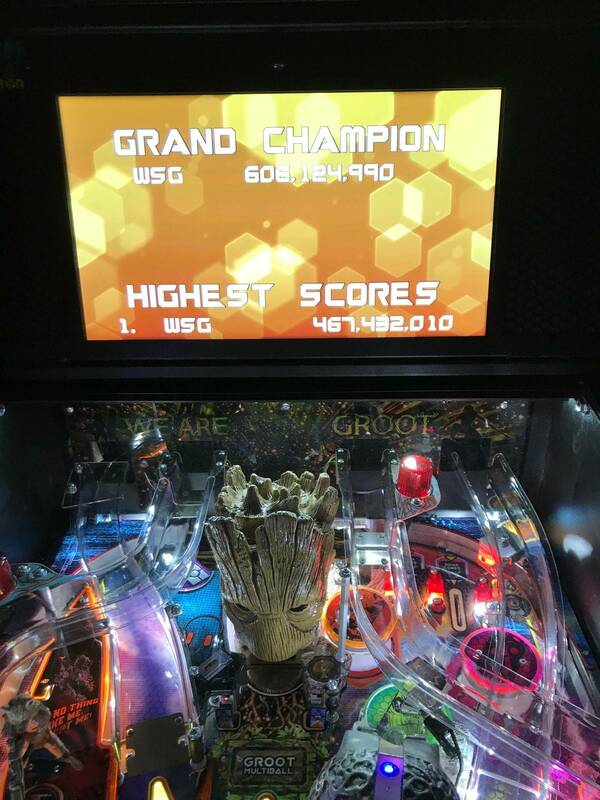 It did do a hard grab during Groot multi-ball. It also is active during the Orb Multi-Ball, but not when the ball is dropped out of the Orb lock. This change coincided with the code update. It has definitely changed how the magnet is working on my Pro. I am in agreement Sinestro- a lot softer of the magnet for the last few updates. The ball used to grab hard every time with a nice tight swirl. Now maybe the first time out of the orb, but mostly a random push. I am still happy with the game and its progression. I am guilty of saving up quite a few HE buttons.I had a game this week where I used it in II and , had all 6 balls in play and got 917 million in Immolation. It looks like you can make adjustments for the cap on the Hadron. OK, so an update on my magnet situation. I did a factory reset, no change. I did a full re-install of the software with verify on. Everything went smooth, but no change. So I took the glass off and started playing with the orb lock manually. I noticed that the magnet is still coming on, it's just coming on about a half second late. Not even enough to effect the ball even slightly, just late enough for a clear miss. If I hold my hand over the Magna-Force light (which is below the actual magnet) the ball will drop out of the orb, hit my hand and the magnet catches it like normal. I wonder if the timing changed with .95, and it's only affecting certain machines (I realize no two are exactly the same). I think I'll hit Cleland up for a .90 image, and see if it works again under .90. I also tried the reset a couple times- but no change in the way the magnet is now affecting the ball. I tried wedging the magnet in place with a couple of foam spacers, but I cannot recommend it.I got about 4 hard captures on the magnet , and then right back to just a push as it drops out of the orb.I have taken the magnet out to cool as the thermal overload dropped power to the coil- guess I tried too many times. Still pondering this one- I have the playfield at the steepest angle possible and will decrease it, but not overly optimistic it will c affect the magnet. I have not had the drop target behave like that ever.Does it always act like that ? What is the objective to hit in "Antiquities 2"? The only insert I see flashing in "A2" is the Orb. I have hit it but nothing out of the ordinary happens. Has Anyone been awarded a Special?I have had the Special insert lit many times during II and SX, but have yet to score one, at least I don't think I have. It is difficult to focus on the screen during the multiballs. The only time I have been awarded a special was back in V1.0 and it was awarded as a Mystery award. I got zero bites on the first post , but still interested in learn if anyone has an opinion on the Special. I contacted Stern with the question , and still waiting for a response...oh no , I am starting to feel as if the Special is not so special. I was wanting to know if anyone has been awarded a Special- thus far for me it has only been once and awarded as a mystery award with great graphics on the display.Special...Special...anyone...Bueller? 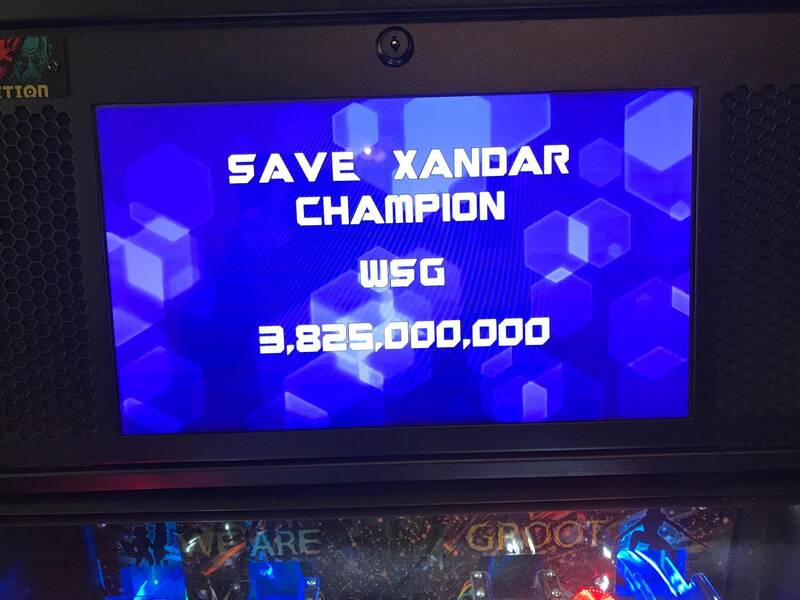 I just had a descent game myself,and finished Save Xandar with the last lit Super shot to the scoop for close to 3B.The screen explodes in purple much the same as the final shot in CB. 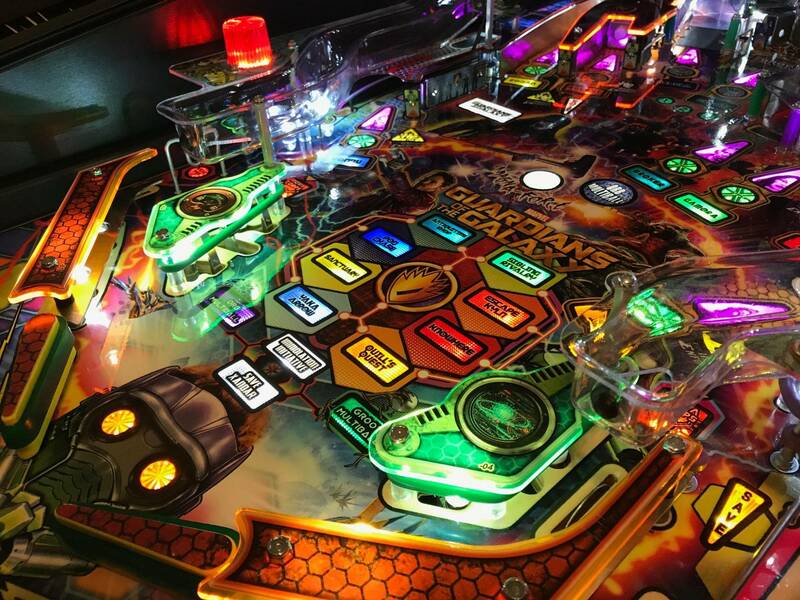 I have finished SX 4 times.I wished I had someone video the display to see what is going on throughout the mayhem of keeping the multiball going.I have seen the dance off,the holding of the Infinity Stone and Quills mom, but it is tough to look up at the display most times. When I did Immolation, don't even know what I was hitting since I was just concentrating on the flippers and not where the balls went. I just kept hearing Rocket tell me "Scoring Multiplier". My best on this mode is like 600M. I think you are correct the 2X shots, If I am 1 shot away from II or SX- I will avoid the scoop try to build up as many 2X shots as I can before starting the mode.II is one mode where I have no idea what is happening on the display screen-other than the beginning with Ronan. Again really nice score ,cheers. 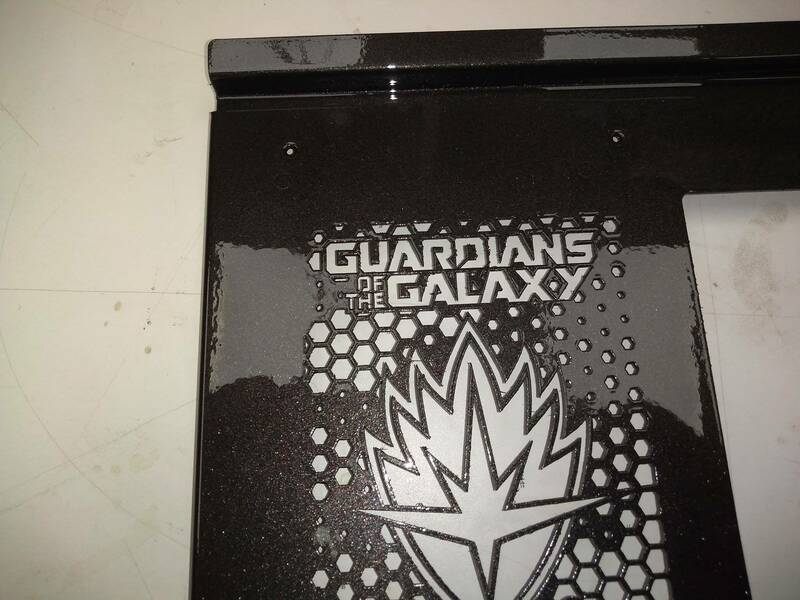 recently had my GOTG Pro powder coated by Rob Stone. I spent considerable time picking color which we are calling Disco Nights. Looks really nice, can't tell from the pictures but wondering if you did the legs also. It’s in the rules. I’ve gotten it lit a couple times (out of many hundreds of plays). Unfortunately, as soon as you “want” to left drain; it suddenly becomes impossible. So I have yet to hit it when it was lit. I am not so sure that it really is in the rules. I have read the code updates and have yet to find any reference to the Special.I see it lit many times in Orb MB and have drained the left side without receiving anything. I have asked for any input on the Special, but have not seen any responses as yet. I even contacted Stern with the question- still waiting to hear from them as well. Back in post #1579- I got a Special as a Mystery award- the animation on the display was awesome with a fly over by the Milano. This was the one and only time that I have seen this. Well, I just totally beat it up!!! Immolation!! Save Xandar! Anyone beat my score!!??! Nice job! !Ha- not even close for me.My best is 8b, and 5b of that was completing Save Xandar Super Jackpot shoot twice.Congrats! I had a similar issue with mine, turned out one of my slings was set to tight. The act of loading the ball into the shooter lane shoot the machine just right and it would trigger the sling to fire, giving me points and also starting the mode. It took me awhile to figure it out because the noise of the ball loading into the lane was louder and more distracting the the sling firing. If it isn't the sling, maybe you have a different switch activating when the ball enters the lane. 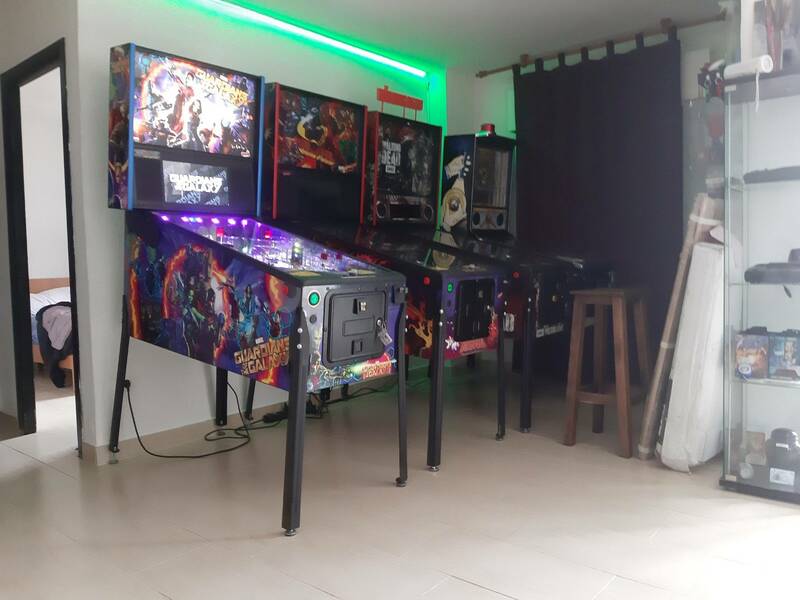 I think this a good diagnosis- i would put the game in Switch Test and bang on the cabinet and playfield to see if there is a switch that is firing . Ran into a little issue yesterday with my left flipper. It's getting stuck in the up position. I did a thread search but couldn't find anything. When I tap the right flipper button, it will fall back down. Has anyone had a similar problem? I had the same issue with the left and it was mechanical. The part of the coils stop that sits in the coil sleeve had worn and was barely held in place by the rivet. Cleaned everything, replaced both sleeve and coil stop .